Is Canonical about to reveal an Ubuntu-powered tablet? One of the most popular versions of the Linux OS could be coming to tablets and phones in a big way. 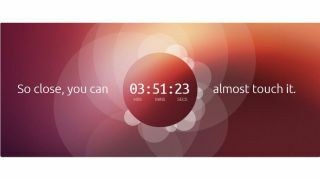 A countdown that ends at 6PM UK time today with the catchphrase 'So close, you can almost touch it', suggests that Canonical, the company behind popular Linux OS Ubuntu, has finally put together a fully touch-enabled version of its platform. However, strong rumours suggest that the firm is not only going to make good on its promise to make Ubuntu touch-friendly for the mobile space (it's been pledging to do such a thing with Ubuntu Unity for some time) but also that it has partnered with an OEM to launch the new version with hardware too. According to PhoneNews, Canonical will take to the stage tonight to present a 'new breed of Ubuntu devices, under the Ubuntu Touch banner'. This means that the company is stepping up its efforts to make Ubuntu a widely used platform on mobile devices as well as the desktop environment. News of the devices has been 'gleaned' from trackers for the new Ubuntu release schedule, which seems to confirm that OEMs are working with Canonical to present the Ubuntu Touch experience. Indeed, Canonical has long been vocal in its plans to push into the mobile space, calling it 'crucial' for the company to stay relevant in an interview run by Slashdot with Canonical's founder, Mark Shuttleworth. He added that the company was looking to create a single OS that could run across multiple platforms: "Let's make one OS that runs on the phone AND on your supercomputer," while also confirming that he was looking to bring a Ubuntu-powered tablet to the shops in the near future. The same firm also confirmed to our partner title, Linux Format, that it was "working hard to bring both Ubuntu TV and Ubuntu for Android to market," so a truly cross-platform change could be coming. Update: it turns out that it was Ubuntu for smartphones that was launching from Canonical, but the company did confirm that it was bringing out a tablet based on the OS in the near future too.